The TCL 55S517 offers a 4K HDR LCD screen with excellent color range and accuracy for a price most would pay for a gaming monitor. This value product is a great upgrade for your couch gaming setup where a large size and incredible visuals are most crucial. The TCL 55S517 has a few limitations compared to a dedicated gaming monitor, but its image quality scores and affordability might sway even the most meticulous users. The TCL 55S517 sports a streamlined chassis thanks to a design that placed the rear bulge at the lower half which gives the product a sleek side profile. The device comes with a smooth matte black finish that doesn’t attract dust and smudges easily. This model isn’t bezel free unlike some OLED TVs we’ve seen, but the panel borders are slim enough to be unnoticeable even when the screen is in use. You will find a round bump which holds the IR sensor and power light at the middle of the bottom bezel for easy access. There are logos for Roku TV and the brand itself on the bottom strip, but the product still manages to look clean and classy. Build quality for the TCL 55S517 is decent thanks to the durable plastics used in the device. We did not find any creaking or flexing issues on the panels, plus the whole product feels hefty and solid at 33 lbs. Pick a nice spot to place this TV on since the half-inch upper part of the display doesn’t look like it will hold against toppling over caused by an accident. The rear of the TCL 55S517 holds of its functionalities save for the IR sensor up front. There is a VESA bolt pattern with a 200 x 200 spread for aftermarket mounts in case the 10 inch-deep stands don’t cut it or if you need flexibility. This model doesn’t even offer tilt since its quite large, but that’s forgivable for modern LCD TVs. The TCL 55S517 comes with an excellently-equipped I/O layout which is designed to cover just about every device you will need for a gaming or home theatre setup. The right panel holds three HDMI 2.0 slots along with satellite, optical audio, and composite audio inputs. 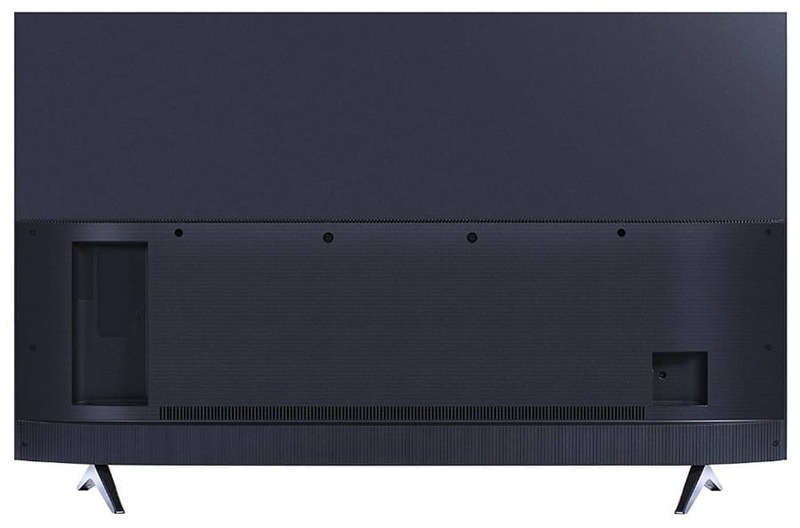 There is also a LAN port for internet connectivity and a single USB 2.0 slot which we assume is for updating the TV’s firmware. The package also includes an upgraded Roku TV remote which accesses the device’s smart features via IR or wireless connectivity. This gadget provides easy access via big navigation buttons or by Roku’s voice search feature. You will also find dedicated buttons for popular streaming services such as Hulu or Netflix. The Roku Voice Search feature is one of the more capable platforms we’ve used when it comes to looking for content. However, full-featured voice assistants such as Google Assistant or Amazon Alexa are more versatile for various other uses such as setting timers or controlling smart home devices. Thankfully, the TCL 55S517 is compatible with a recently released Alexa skill that lets you manipulate Roku devices with any Amazon Echo gadget. The TCL 55S517 boasts a 55-inch VA panel with a 3840 x 2160 resolution, 60Hz refresh rate, and 7ms minimum response time. VA tech is the primary choice for low-priced 4K HDR TVs because OLEDs are still impractically expensive to make and utilize. The extended 6000:1 contrast ratio is another factor for this configuration, along the TV to create deep blacks which most LCD technologies have struggled with. One of the main issues of TVs is the lower pixel density which makes the screen look fuzzy or pixelated depending on sitting distance. We recommend placing the TCL 55S517 anywhere from a meter to around 3.5 meters away from your couch so you can enjoy a comfortable sweet spot. It’s always ideal to sit at a considerable distance, but the level of detail diminishes the further you go. The TCL 55S517 is capable of superb color coverage, reaching 94% of the DCI-P3 gamut which makes it ideal for HDR imagery. Accuracy out of the box hits an average of Delta E 2.3 which is fantastic for a TV, but you can tighten it down to DE .5 with a more ideal color temp setting via the TCL Android or iOS app. Frankly, this TV is one of the most user-friendly options out there when it comes to adjusting the screen, making it a suitable choice for the non-technically-inclined. The VA panel in the TCL 55S517 also posts a strong contrast ratio which reaches 6200:1 and a perfect 2.2 gamma setting. Color separation is well defined and blacks are deep and solid, but there are minor issues in shadows which makes them a bit muddy up close. But to be fair, the only real weakness we see in this model is its dim backlight which tops out at 300cd/m2 for HDR where a more powerful backlight with local dimming is necessary. Panel uniformity for the TCL 55S517 review unit is great except for slightly darker edges when viewing light-colored images. For most applications this wouldn’t be an issue especially at this price, but it’s something to consider if you are willing to spend more on an OLED option. Black screens and dark images are less affected, so we think most will still enjoy this TV with no questions asked. One of the main concerns on VA screens like the TCL 55S517 is its motion handling capabilities. Thankfully, this model showed reasonable capabilities which kept blurring to a minimum. Trails and smudges can still become visible in fast-paced sequences, but the limited refresh rate is the larger factor here. Another contributing factor to this minor flaw is the backlight’s PWM flicker at the lowest settings. This shouldn’t be an issue for most since the TV is already dim, so a brightness setting below 14 will not see any use for the most part. The TCL 55S517 is still flicker-free above the mentioned threshold, so it’s pointless to use this fact against the affordable device. The TCL 55S517 has a very high 65ms average input lag by default, making it unsuitable and slow even for use as a PC monitor. However, the OSD carries a Game Mode function which cuts out unnecessary processes to reduce latency to 18ms which is well below the limits set for gaming TVs. You lose a bit of detail if this mode is activated, but the sacrifice is worth it for our favorite hobby. 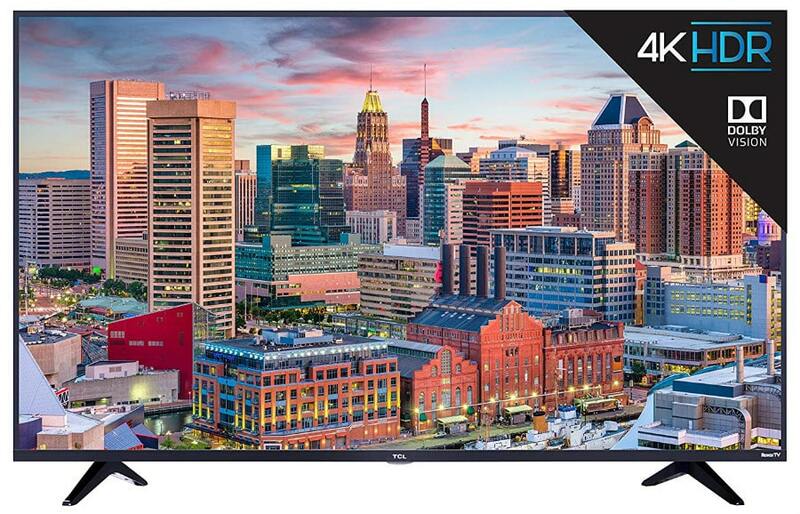 The TCL 55S517 is a fantastic 4K HDR option for thrifty shoppers who want the best value out of every dollar spent. This model costs less than half a grand, but it offers excellent image quality and vibrancy for HDR gaming and movies. It could use some improvements in its brightness aspect, but we think that’s still forgivable considering the money you will save if you go with this option. There are a few options which are better at the TCL 55S517’s weak points, but most of them like the LG C8 have OLED panels. They also cost exponentially higher, putting them out of reach for the majority of consumers worldwide. If you are in the market for an inexpensive 4K HDR solution for your couch gaming or home theatre setup, this budget-friendly offering should be at the top of your list.